Liven up your business seminars! 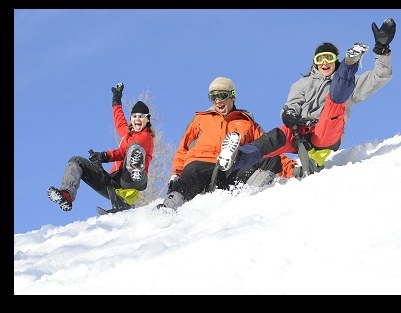 : Ecole Ski Academy offers different solutions and organizes tailor made activities. We can also organise accommodation if requires. Imagine yourself lying on a cushion of air, face down, just above the snow. Your airboard can be steered by positioning the weight of your body to one side or the other. The sensation of high speed is guaranteed thanks to the proximity of the snow. It is a blast! According to those who have tried the airboard, the behaviour is instinctive, safe and fast! The Airboard is an activity accessible to skiers and non-skiers and of any age and is great fun! So, why not come and give this new activity a go? Airboarding is carried out after the lifts close on the 5 km track by the chairlift Pierre-Longue supervised, of course, by the instructors of Ecole Ski Academy. Airboards provided by Ecole Ski Academy. Helmet and ski boots required. Ecole Ski Academy provides race organisation for groups of friends, work colleagues etc on the race piste of the Linga where you can enjoy a super atmosphere. Competitions can be organized in the form of F1 Grand Prix with a practise run followed by a qualifying session (lap) to determine the starting grid for the final. Several possible options are available: start list, timepieces, declaration of results, etc. Are you dreaming? : slide down the pistes easily, have even more thrills, all without learning ... It's done with the arrival in Ecole Ski Academy of Yooner! Sitting about 20 cm from the ground, like a snow kart, this new vehicle is an invitation to slide! The Yooner is light, handy, equipped with a shock absorber for comfort and a shoe that allows you to "carve turns" as in skiing. The activity is carried out after the lifts close on the 5 km track by the chairlift Pierre-Longue supervised by instructors of Ecole Ski Academy. Yooner provided by School Ski Academy. Helmet required. 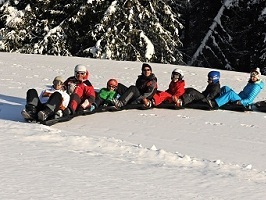 This Après ski activity is a must, the Snake-Gliss (or sledge Rando) is a unique concept of being on articulated sleds. 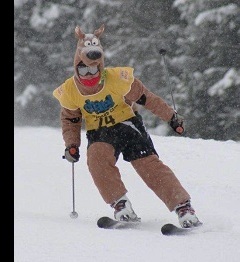 The Snake is hitting the ski slopes like a snake on the snow! Equipped with fins and controllable with the feet, these sleds allow you to make perfect curves. In a memorable atmosphere: unusual sensations are guaranteed! 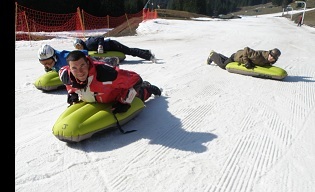 Supervised and / or controlled by the ski school instructors Academy, indulge in adventure-Snake Gliss! The activity is carried out after the lifts close on the 5 km track by the chairlift Pierre-Longue supervised by instructors of Ecole Ski Academy. Snake provided by School Ski Academy. Helmet required. 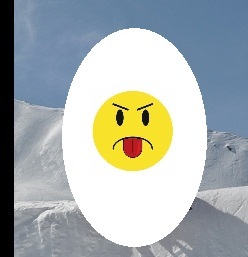 Ok, you are not a skier - but the majestic scenery of our mountains attracts you? In which case, the TaxiSki might be for you! Discovering Mont Blanc and Lake Geneva in the comfort of your secure seat, the experienced instructor will take you wherever you want. Discover the unique atmosphere of the slopes or off-piste and visit mountain restaurants with their specialties. Be guided by the stars to a mountain restaurant. 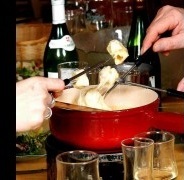 After 30 minutes of snowshoeing, enjoy a traditional Savoyard meal of the Abondance valley cheese or fondue or raclette followed by *gnolle. Then enjoy the descent by Airboard i/ Snake Glisse or walk by the light of your torches.